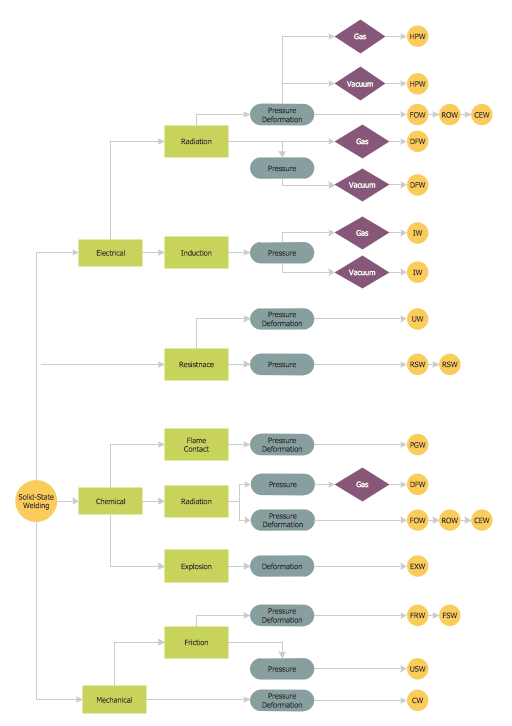 A Flowchart is a graphically representation of the process, algorithm or the step-by-step solution of the problem. The Flowcharts are widely used in engineering, architecture, science, analytics, government, politics, business, marketing, manufacturing, administration, etc. The geometric figures on the Flowchart represent the steps of the process and are connected with arrows that show the sequence of the actions. This sample shows the Flowchart that displays the solid-state welding processes, the types of welding. Use Case Diagrams technology. An effective management of changes is significantly facilitated by way of definition and documenting of business-requirements. The Flowcharts have one or more starting and ending points. The geometric figures on the Flowcharts represent the steps of the process and are connected with arrows that show the sequence of the actions. The Flowcharts can be orientated vertically or horizontally. ConceptDraw DIAGRAM v12 is a powerful software for creating professional looking Flowcharts quick and easy. For this purpose you can use the Flowcharts solution from the What is a Diagram area of ConceptDraw Solution Park.